The Economist magazine’s Democracy Index places Sri Lanka in 66th place among recognised countries. The index is constructed by considering countries’ election processes, government-funded facilities, political participation, political culture and civil freedom. Iceland, Sweden, New Zealand and Denmark are ranked the most democratic countries in the world respectively. 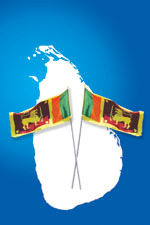 Sri Lanka has scored 6.48 points in the 2016 Democracy Index, improving on its score of 6.42 in 2015 and 5.69 in 2014. It is placed 12th among countries in the Asia-Pacific region.